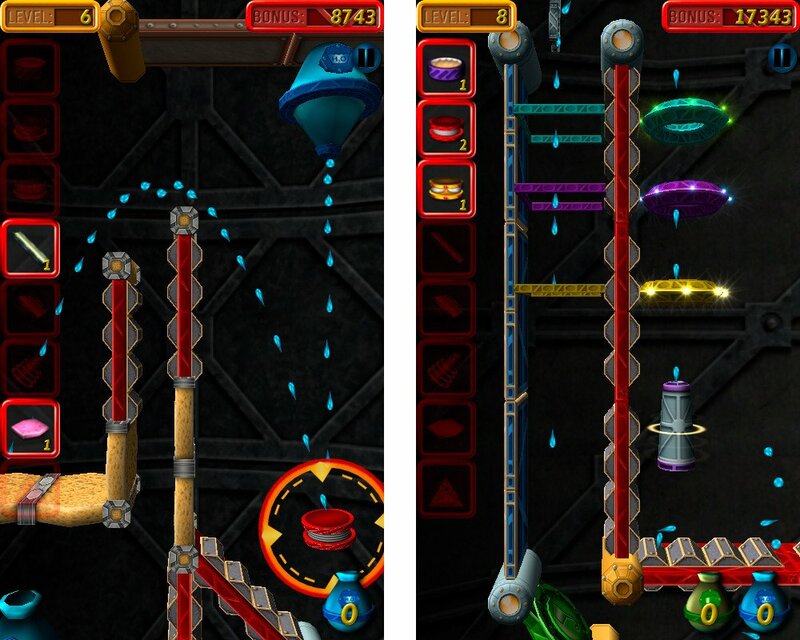 iBlast Moki may have been the first Xbox Live physics puzzler on Windows Phone, but the genre itself goes much farther back. 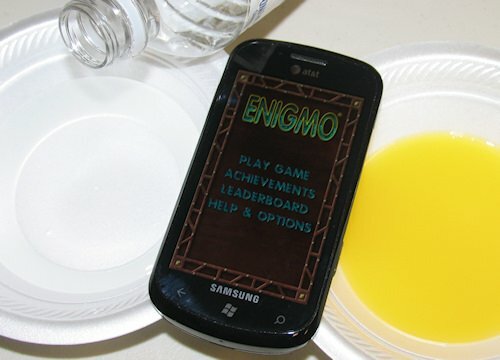 Take, for example, Enigmo, a game that Austin-based Pangaea Software originally published on personal computers in 2003. The puzzler met with huge success at the time, and has since been ported to a variety of platforms as well as spawning a sequel. 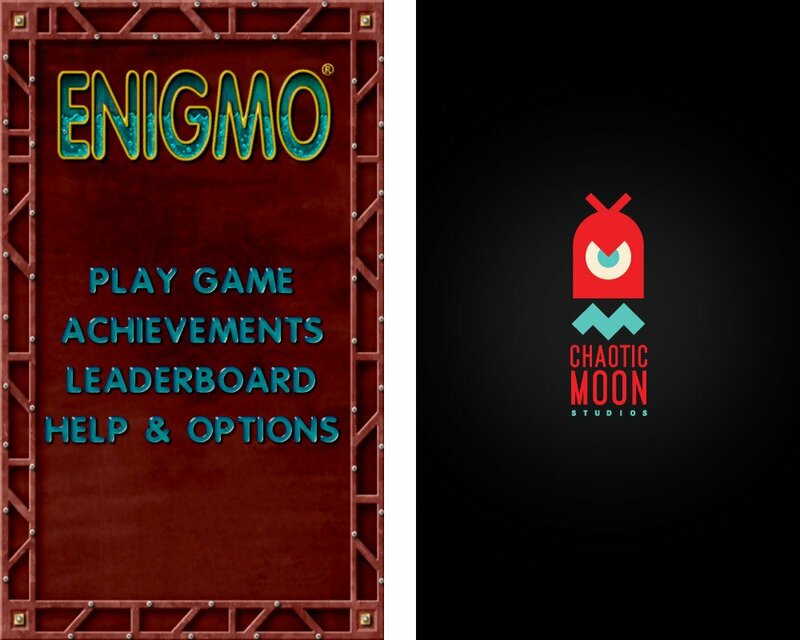 The Windows Phone port of Enigmo comes from fellow Austin developer Chaotic Moon Studios. It’s a no-frills port, but the cerebral gameplay holds up quite well. Splash past the break for our full review. Enigmo is all about transporting water and other liquids from one place to another. Each level contains both a water drip and a matching receptacle. Players are given one or more objects with which to steer the water in the right direction. First objects must be positioned by dragging and dropping them, at which point a rotation cursor appears. Position everything correctly and the water can bounce or drip into the vessel. After it collects 40 drops, the level ends. Later levels increase in complexity, adding oil and lava to the mix. Each fluid must be directed into its own matching container. Every receptacle’s contents slowly drain away if not replenished, so all three liquids need to flow constantly into the proper containers in order to finish. Sometimes you’ll need to deal with the various liquids in a certain order, as a barrier may block one of the drips, requiring a separate liquid to hit a switch and keep the barrier open. Enigmo unfortunately lacks any kind of tutorial or help text, so players must figure out what each of the 8 tools does on their own. These include several sizes of bumpers for bouncing liquids in different directions, a couple of girder-like objects that liquids flow over instead of bouncing, a nozzle that propels fluids in a straight direction, and a sponge that catches drops at different angles and distills them from a single point. Imagine what a tough job plumbers would have if they had to work with these things instead of pipes! Puzzles tend to offer more tools than their solutions actually require, so there is plenty of room for experimentation. With 50 puzzles to solve, Enigmo will keep players busy for quite a while. Unfortunately, the levels are presented in a linear order and can’t be replayed out of order. 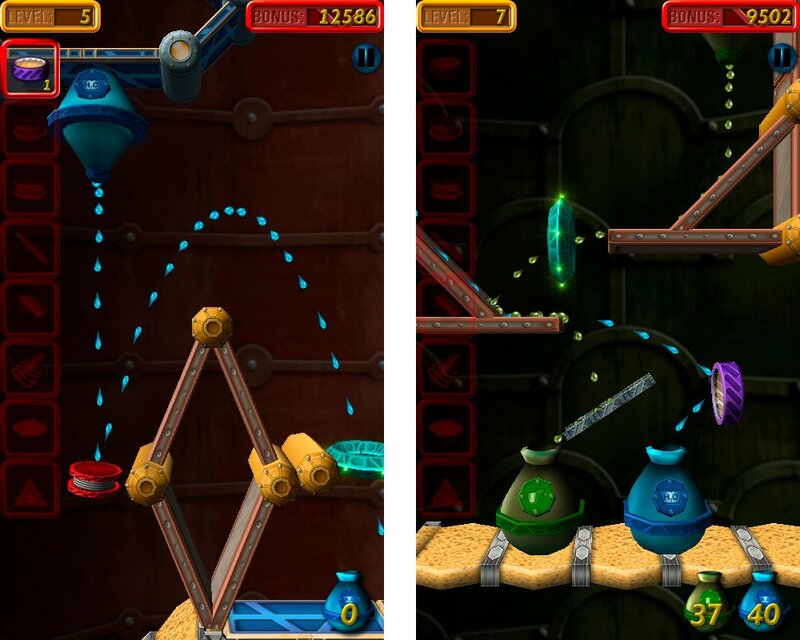 Newer physics puzzlers like iBlast Moki and Tiki Towers allow players to tackle levels in any order, which both encourages replaying them for higher scores and allows players to move on to another puzzle when they get stumped. Should you get stuck in Enigmo, you pretty much have to look up a solution online if you want to keep playing. Thankfully those are not hard to come by, should you need them. Enigmo’s time-based scoring system is also a bit rigid. Following an unskippable flyby at the start of each level, the gamer’s score immediately starts ticking down from 30,000 points. The faster you solve the puzzle, the higher your score for that level, which contributes to an overall campaign score. Take too long and the game literally awards no points for the level. Most physics puzzles games I’ve played have discreet planning and action phases, scoring based on the efficiency of the player’s solution rather than how long the puzzle took to solve. Enigmo does have a couple of score-based Achievements, so scoring is not inconsequential. But at least once those scores are reached, players can freely ignore the timing pressure and simply enjoy the game. One area where Enigmo doesn’t show its age is the art department. While the game takes place in a two-dimensional space, its graphics are entirely 3D. This gives the game a completely different look from its aforementioned Xbox Live contemporaries. Everything has a mechanical, futuristic appearance. Enigmo’s music is entirely composed of romantic guitar melodies. The catchy and unique tunes instill what might otherwise be a cold and sterile game with some much appreciated character. First off, Enigmo has a single broken Achievement: “Mad Scientist,” which should be awarded for completing all 50 levels. Chaotic Moon tells us the glitch will be fixed in a future update, which hopefully will come soon. If you’re interested in playing the game now, you can always beat it and then start your save game up after the patch hits. It should unlock at that point. Some of the Achievements I really enjoyed were the ones for completing levels with objects to spare. They encourage thriftiness and clever thinking. The hardest of these is “Were Those Important” - Complete a level with 4 or more unused pieces. I got that one on level 28, by the way. The only Achievements that I didn’t enjoy are the score-based ones, “Respectable” and “Enigmaster.” Basically players will need to score 500,000 points over the course of the campaign in order to unlock them both. It’s quite possible to beat the game with over a million points, especially if you look up solutions online. But as I said before, I don’t think the added pressure of the scoring system adds anything to the experience. 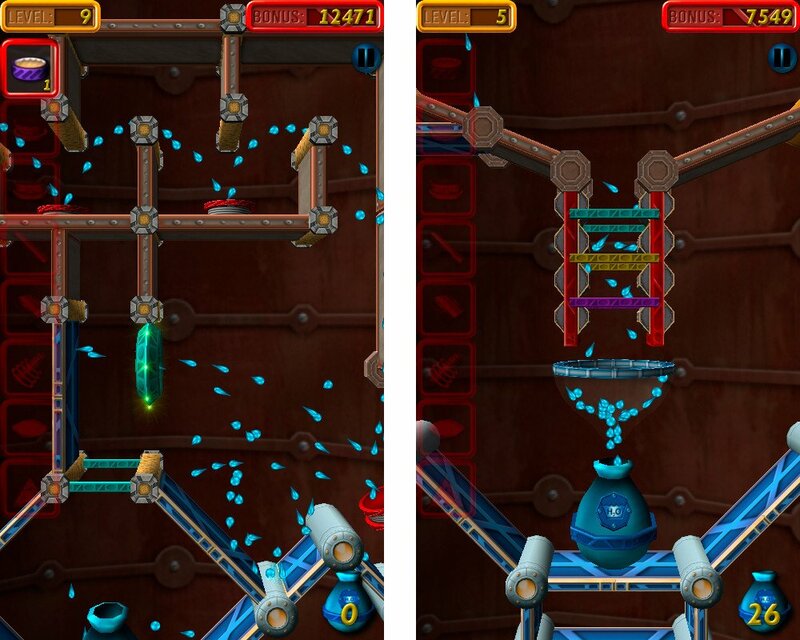 Physics puzzlers are challenging and rewarding experiences. 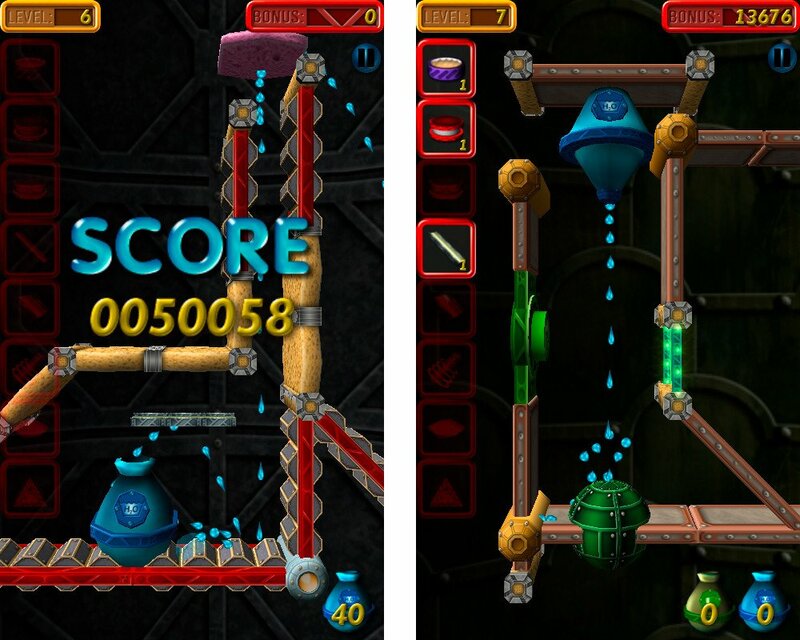 Enigmo stands out from the crowd thanks to its clever liquid-based puzzles, attractive graphics, and distinctive music. I only wish the mobile Xbox Live version was more than a straight port, as some of the game’s elements haven’t aged well. A proper tutorial would make it much more accessible to new players, and a level select would greatly enhance the replay value. But even without those modern amenities, I still loved dipping into Enigmo’s waters. With any luck, Enigmo 2 (which expands the puzzles themselves into the third dimension) will wash up on Windows Phone shores sometime in the future as well. Whoops, I just used two water-based metaphors in a row – hope that doesn’t sink my review! Enigmo costs $2.99 and there is a free trial. Puzzle fans can find it here (Zune link) on the Marketplace.